Since the launch of our PCN plant proteins, a lot of questions have been brought forth regarding the Prop 65 warning disclaimer we have chosen to put on our labels. The state of CA requires all products manufactured and sold in California, to carry Proposition 65 Warning on their labels regardless of the source and limits of heavy metals inside a product. PCN plant proteins have traces of naturally occurring heaving metals in both pea and brown rice protein, (as all root vegetables and plants do as well), and even though the heavy metal presence was lab tested within safe limits, the warning still had to be displayed to avoid unjustified lawsuits. The Prop 65 warning signs in California are as abundant as sand on the beach – you see them on everything from hardware, machinery, to produce sections and even in bars and restaurants. Some warnings are legitimate due to the true presence of chemicals from pollutants such as smog, fuel, cigarette smoke, but the signs found on produce and natural health supplements are unfortunately necessary in order to avoid lawsuits. This law is unfairly penalizing all the companies that actually do manufacture 100% healthy and safe products and we are one of them. Proposition 65 (formally titled “The Safe Drinking Water and Toxic Enforcement Act of 1986”) is a California law passed by direct voter initiative in 1986 by a 63%-37% vote. Its goals are to protect drinking water sources from toxic substances that may cause cancer and birth defects and to reduce or eliminate exposures to those chemicals generally, for example in consumer products, by requiring warnings in advance of those exposures. Proposition 65 is administered by Cal/EPA’s California Office of Environmental Health Hazard Assessment (OEHHA). Proposition 65 regulates substances officially listed by California as having a 1 in 100,000 chance of causing cancer over a 70-year period or birth defects or other reproductive harm in two ways. The first statutory requirement of Proposition 65 prohibits businesses from knowingly discharging listed substances into drinking water sources, or onto land where the substances can pass into drinking water sources. The second prohibits businesses from knowingly exposing individuals to listed substances without providing a clear and reasonable warning. An official list of substances covered by Proposition 65 is maintained and made publicly available. Chemicals are added to or removed from the official list based on California’s analysis of current scientific information. All substances listed show their known risk factors, a unique CAS chemical classification number, the date they were listed, and, if so, whether they have been delisted. Proposition 65 remains politically controversial even after 25 years, in large part because, in effect, it puts the burden of proof on business instead of government to make a key scientific determination about safety levels for specific toxic chemicals that the businesses are knowingly exposing members of the public to. According to the California Environmental Protection Agency, “Proposition 65 has… increased public awareness about the adverse effects of exposures to listed chemicals…. [and] provided an incentive for manufacturers to remove listed chemicals from their products…. Although Proposition 65 has benefited Californians, it has come at a cost for companies doing business in the state. The law has also been criticized for the proliferation of “bounty hunter” lawsuits. Attorneys have collected more than two-thirds of the money paid by businesses to settle Proposition 65 lawsuits since 2000. How does Prop 65 affect the food and supplement industry? Nearly all foods contain certain levels of one or more of the following Prop 65 substances: arsenic, cadmium, lead and mercury. Ironically, the amounts established by Proposition 65 can be less than what occurs naturally in fruits and vegetables. Researchers have reported levels of heavy metals, pesticides and other environmental chemicals in a wide variety of healthy foods such as – alfalfa, artichokes, apples, cocoa, corn, carrots, cinnamon, coffee, cucumbers, oranges, potatoes, pears, plums, parsnips, parsley, peppers, mangoes, mushrooms, mustard, shrimp, various spices, spinach, turnips, yams, and most whole grains. The levels in California-grown produce average 4 times the Prop 65 limit, and for some produce the per cup levels are over 50 times the allowable Prop 65 limit. Therefore, a warning label could technically be placed on most items in the grocery produce section and beyond. So just because natural and raw food items we consume don’t have PROP 65 label doesn’t mean they don’t contain heavy metals. The issue is, however, a political one, with a bias toward agriculture – produce – fruits and vegetables, it is not mandated to have warning labels placed on such items, yet when a grain of rice is placed in a container as of form of protein it now requires a warning label. Highly unfair! While it is important to pay attention to all product warnings, the standards for Prop 65 warnings are often very strict, and are based on very low levels of exposure. This means they could be applicable to products exhibiting levels thousands of times lower than the lowest amount indicated to cause any potential harm. Prop 65 does hold businesses and manufacturers accountable for knowingly adding hazardous materials to their products, but it can be problematic for healthy dietary supplement manufacturers. Despite the safety, purity and highest quality of Pure Charge Nutrition ingredients and products, Prop 65 requires a label on any product (not just food) that has traces of certain chemicals and heavy metals. Almost all grown foods have some amount of heavy metals as they are naturally occurring in soil, which is the reason why our proteins require such warning that is solely based on PROP 65’s extremely low heavy metal limits and absolutely nothing else. While obliged to label in accordance to Prop 65 regulations, a warning on a Pure Charge Nutrition product does not automatically mean that the product is unsafe or harmful. It is actually quite a contrary, and subjected to thorough safety testings that we stand by 100%! 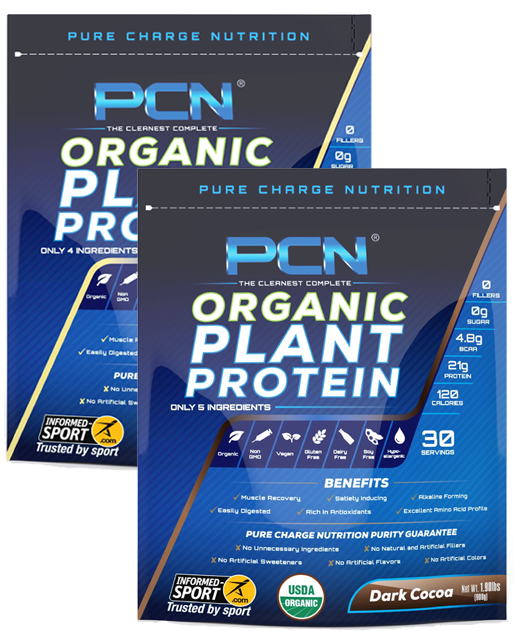 Pure Charge Nutrition holds quality and safety to the utmost concern, and we use only the highest quality ingredients and conduct rigorous testing to protect your health. All our ingredients are GRAS certified (Generally Recognized as Safe by FDA). We at Pure Charge Nutrition realize that this disclaimer sounds foreboding in the way it is stated, but understanding what PROP 65 law is and why it is on our labels should establish confidence in safety of each and every ingredient in our products. We have made a conscious decision to disclose this information for the sake of transparency, honesty and informativeness. 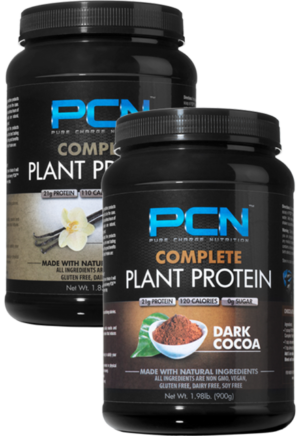 Non-GMO Pea Protein, Organic Brown Rice Protein, Natural Flavors, Stevia Extract. Non-GMO Pea Protein, Organic Brown Rice Protein, Organic Alkalized Cocoa Powder, Natural Flavors, Stevia Extract. Pea protein is an excellent vegetable protein source made from extracting the soluble pea protein from yellow peas and is rich in essential amino acids. Cultivated for food since 6,000 B.C., they have provided people with a low-cost, nutrient-rich form of plant protein, necessary for good health. Pea protein is entirely plant-based. It is low in fat and carbohydrates and free of soy, gluten and lactose. These attributes deem pea protein suitable for those who suffer from food allergies and food sensitivities. Pea protein has a high biological value, meaning your body absorbs it easily. Pea protein delivers large amounts of the essential branched-chain amino acids; isoleucine, valine, arginine and lysine. It is satiety inducing and slowly digested for extended energy. Pea protein is often combined with rice protein to achieve a superior amino acid profile than either protein alone. Brown rice protein is an excellent source of good quality protein made from the whole brown rice grain. Brown rice protein is a complete protein with a balanced amino acid profile and consumption of it ensures a vital role in a healthy nutrition. Even though there are several kinds of protein sources like soy and whey, brown rice protein excels above all of them for more than one reason. While whey protein comes from milk, it doesn’t suit some people because they do not wish to use animal-based protein. On the other hand, soy protein often is difficult for people to digest and may pose allergy risks. And sometimes consumers simply don’t like the taste of these organic proteins. In contrast to all these, brown rice protein is a vegan, hypo-allergenic protein that is easy to digest and good in taste. Apart from its individual inherent benefits, the presence and significance of brown rice protein in certain food ingredients enhances the nutritional quality of the product immensely. For this reason, nowadays, brown rice protein is part of the dietary staple for more than the half of the population of the world and is gradually catching up with the rest. Stevia, the amazing plant originally from Paraguay, South America, has sweet leaves that contain about 30-45 times the sweetness of sugar with no calories! Used for hundreds of years by the natives of this region to sweeten their food, it has now become the most important sweetener, in its purified form, for use in foods as a healthy alternative to sugar and artificial sweeteners like aspartame and sucralose. For best taste and texture start with adding one scoop of PCN Complete Plant Protein powder to 4 oz of water and 3 oz of unsweetened non dairy milks (almond, rice, cashew, etc). Add more fluids to your liking, and you can always be creative with adding the protein powder to your favorite shake or smoothie. Place all ingredients into shaker cup or blender and mix well until smooth. Please visit our Nutrition page for delicious smoothie ideas and recipes. *Please note: For consumers not familiar with plant proteins, we strongly suggest you mix the plant protein powder with UNSWEETENED almond milk, or any other UNSWEETENED non dairy milk, and of course adding it to your smoothie will integrate even better. This will provide smoother texture and overall better taste. It will be an acquired taste for those making a switch from dairy based proteins, but once the switch is made your body will thank you for it in many different ways! First thing in the morning upon waking to satisfy your body’s need for quick protein. 1 Hour before and right after your workout or physical activity for proper muscle fueling and recovery. During the day for a protein rich snack. Before bed for overnight muscle recovery.